Buffalo, NY, January, 2018: Manitoba Corporation has been re-certified to the ISO 9001:2015 standard after having successfully completed their audit by Bureau Veritas in November of ’17. Manitoba has been an ISO certified company since December of 2003. Company President, Brian Shine says, “ISO ensures that we are working to continually improve all aspects of our organization for the benefit of our suppliers, our employees and our customers. One of the many improvements resulting from ISO is the measurable it has helped us establish.” Manitoba’s re-certification shows commitment to improving the quality of its operation. A copy of updated certification can be found on the website at www.manitobacorp.com. Buffalo, NY – December 18, 2017 – Today marks the start of Lindsay Batrowny's Manitoba career. Lindsay has been hired as Manitoba's controller. LIndsay comes with 12 years of experience from Freed Maxick where she was a Senior Manager at the time she left. "We are thrilled to have Lindsay join our team", said Brian Shine, company President. "It's clear she was the best candidate for the job and we are excited to apply her skills to our growing business." Buffalo, NY – November 3, 2017 – Manitoba Corporation is very proud to announce a significant promotion for Julie Tatarski to the position of VP Administration. "Julie has been an incredible contributor to the management of our firm and is being recognized for her skills, loyalty and contributions for continuously improving Manitoba", said Brian Shine, company President. Congratulations Julie and thank you for all you do! 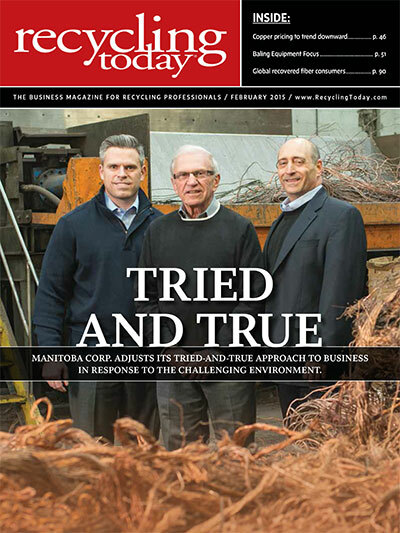 Buffalo, NY – March 1, 2015 – Manitoba Corporation was featured on the front cover and in the spotlight story for Recycling Today Magazine's February issue. "It was a great honor to be featured in such a well respected publication," said CEO Richard Shine. For the full story click the picture below. 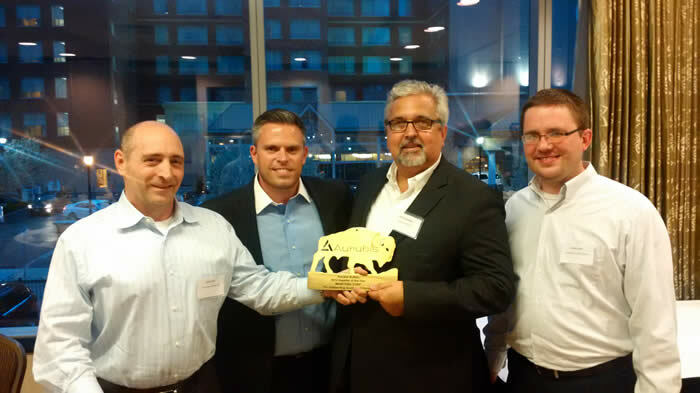 Buffalo, NY – May 22, 2014 – Manitoba Corporation is pleased to be recognized as one of the Aurubis Suppliers of the year. "We value the cross-town relationship we have with the mill and it's an honor to receive this designation", said company President, Brian Shine. Buffalo, NY – October 30, 2012 – Manitoba Corporation is pleased to announce that it has promoted long-time employee Bill Kos to the position of Plant Manager. “Bill was named Plant Manager on his 20th anniversary working for our organization”, said company President, Brian Shine. “Bill has demonstrated tremendous leadership in the areas of employee safety, training and development. He is the perfect fit for the role.” “I am thankful for my 20 year career with Manitoba Corporation and certainly look forward to serving our customers and employees in my new role.” said Bill. Lancaster, NY, April 2012: Manitoba Corporation is pleased to announce the hiring of Russell Burr for the position of controller. Russell is a certified public accountant, and has extensive experience working in this regard. He will be responsible for the day-to-day financial oversight of the company and its various subsidiaries and joint ventures. “We are very pleased to announce that Russell has joined the Manitoba team. We are excited by the opportunity to work closely with Russell as we continue to grow our business in the recycling industry.” says company president Brian Shine. Lancaster, NY, April 2012: Manitoba Corporation is pleased to announce that company President, Brian Shine, who has been with the company for 27 years, has recently been elected to the prestigious position of Secretary/Treasurer of the Institute of Scrap Recycling Industries. Mr. Shine has been an active community member, graduating in 1991 from the Center for Entrepreneurial Leadership program through the University at Buffalo, and is currently a mentor to students of the same program. He is also a graduate of Leadership Buffalo, and a member of the Lancaster Chamber of Commerce. With this election, Mr. Shine will become chairman of ISRI in six years (2018), and serve in that capacity for two years. Mr. Shine has embraced the work of the current board, headed by the current Chairman, Jerry Simms. He is excited to work with the leadership and member body to take on the challenges facing the recycling industry in a pragmatic fashion, and to embrace the opportunities ahead with optimism and hard work. Lancaster, NY, March 2012: Manitoba Corporation is pleased to announce the purchase of a new facility in St. Louis, Missouri. The new building is located at 4400 Geraldine Avenue in St. Louis. The company originally opened the St. Louis facility in 1981 to more quickly serve customers in geographic locations farther than the Lancaster, New York headquarters. This has allowed the company to continue delivering superior customer service to its many customers. Today, the operation, which is headed by long-time manager John Nichols, focuses primarily on nonferrous metals recycling. Manitoba decided that it was necessary to continue to invest in the St. Louis operation’s infrastructure, because of the logistical importance it continues to play in the company’s success. Manitoba Corporation was named 30th in WNY’s Top Private Companies. “It is a real honor” says Manitoba’s President, Brian Shine. “We strive to achieve growth and continued success each year so it’s nice to be recognized for our efforts”. The annual list put out by Buffalo Business First is meant to highlight some of WNY’s most successful, privately held businesses and includes well-known companies such as Rich Products and Delaware North. Manitoba Corporation was presented a Galanis Award for Excellence in Family Business. Manitoba was one of five recipients of this year’s award. The award selection is based on financial stability, innovation, quality of life for employees, record of growth and contributions to the community. Manitoba Corporation was recommended by their longtime friend and partner in a joint venture, Peter Lidner. “If there is one word that characterizes or distinguishes them (Manitoba) from its competition, it would be "creative": In an industry filled with mature competition, Manitoba has grown by expanding business lines, markets and geographic penetration, as well as utilizing and embracing modern operating standards….Furthermore, they embody excellence through: loyalty to customers and employees alike, activism within the local community, and their core family values as embodied in their 4th generation enterprise”, says Linder. The Galanis awards were first started back in 2000 by Terry Galanis Sr. and Terry Galanis Jr. in conjunction with Alfred University. The awards were set up as a way to recognize the importance of family businesses in this region. Having operated their own company Sealing Devices, Inc. for almost 5 decades they realize the importance of recognizing others with similar stories. Sunnking Buffalo, WNY’s largest electronic recycler along with Re-Tree WNY are teaming up with a number of WNY employers for an Earth Day program called “Technology to Ecology” the week of April 19-23. “Technology to Ecology” will allow employees of the participating companies to bring any electronics (PC’s, laptops, keyboards, mice, printers, etc.) and other household items such as small appliances, metal desks & furniture, pots & pans, tools, etc. with them to work where they will be collected for recycling. Proceeds from the scrap will be donated to a local charity, Re-Tree WNY, to purchase trees that will be planted in public spaces throughout the area. Recycling this material will eliminate large amounts of toxic materials from local landfills, ensure that the material is properly recycled and generate revenue to continue the replanting of trees in the public spaces devastated by the October Storm of 2006. Employers from Buffalo, West Seneca, Lancaster, Hamburg, Amherst and Cheektowaga have already agreed to participate and there is still time for any company that wishes to be involved in the event. Please contact Sunnking directly at 716.685.4577 for more information. We are deeply saddened today as we discovered that our former partner and friend, Joseph Baker has passed away. Joseph was 88 years old and was a partner in our business until he was 85. Joe started with the company in 1955 and played a key role in its growth and current success. For those in the industry that knew Joe (and many do) he was kind, caring and relentless in his pursuit to make new friends and land the next deal. Joe will be greatly missed as a partner, mentor and friend. Workers at Manitoba Corp. are busy filling cotton bags with copper chops, which were processed there. A huge bin of the stuff is parked behind them, and the handle of a giant metal scoop sticks out of it. The crew fits cotton bags around a spout. Ten pounds of copper falls into it. It looks like they're bagging coffee. But the aroma about the place isn't java at all. It's propane, from a fleet of busy forklifts. Manitoba Corp. takes unprocessed scrap metal and removes contaminants such as tar-based insulation to be recycled. The company also reduces the size of items to make them suitable for re-melting or dissolving. The coffee bags are sent to a customer who drops them into a unit to melt the copper inside. The cotton burns away nice and clean. The plant is full of pallets with three-foot square copper sheets, each weighing around 300 pounds. Sometimes, these are cut to size for customers to feed into machines to melt copper. Other times entire pallets, weighing around 7,000 pounds, are sent to customers capable of melting an entire sheet or bundle. In another area, shaped like hay bales, are bundles of uncleaned copper wire, waiting to be cleaned and made into smaller, shoebox-sized bricks for customers. These briquettes gleam as if the shiniest pennies were unwound and woven from their threads. Contrasting this are pockets of black empty space creating a roller coaster of interlacing, twisting, looping wires. At a glance the briquettes appear lightweight, as if one could be picked up with one hand. But each weighs about 50 pounds. History: Solomon Shine founded S. Shine and Sons in 1916. He began earning a living picking up rags, waste paper and metals from people's homes. He'd sort and sell it. He earned enough to buy a horse and buggy, then eventually a fleet of horses and buggies. His son Nathan earned a law degree from the University at Buffalo in 1932, practiced law, then joined the company in 1939. He turned his focus on non-ferrous metals after WWII, when synthetic fabrics like nylon, dacron and rayon made rag recycling less necessary. Nathan's son Richard, who today is CEO, began working there in 1970. The name was changed to Manitoba Corp. when headquartered on Manitoba Street in Buffalo and re-launched as a metals company. The company moved to Lancaster in 1991. It also has a smaller facility in St. Louis, Mo., operates a few joint ventures, and has a contract with a company to disassemble photocopiers in California. For retail scrap trade, it runs Lancaster Recycling & Sales Co. Principals: Richard Shine is CEO. His son, Brian, is president. No. of employees: Sixty. In addition to the 50 in Lancaster, 10 work in St. Louis. Revenues: $65 million in 2008. From a volume of materials handled perspective, Brian Shine anticipates revenues to be down in 2009. "Due to a reduction in commodity values, we're optimistic volumes in 2009 will be the same or increased from 2008," Brian Shine said. "The reason I'm so optimistic moving forward is the experience of my father and the enthusiasm of my brother Adam, who joined the company in March as sales manager." Biggest Expenditure: In 2006, the company purchased a $400,000 high-speed shredder, and a $100,000 crane to pick up copper pieces and chop them. They are adjacent to each other in the Lancaster plant. 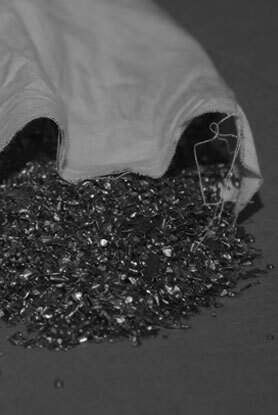 It prepares materials for the chopping line by loading wires or other raw materials into the shredder to reduce size. From there it goes to other places in the plant. "It makes our process more efficient," Brian Shine said. "Rather than feeding long pieces of wire into the chopping machines, it makes the shape of pieces more uniform." Customers: Typically, customers in steel, aluminum, copper, brass and nickel industries have Manitoba Corp. cut copper sheets to size or ground into smaller pieces. They'll use these to make a copper-based alloy or to use copper as an addition to something else they're manufacturing.